This article is about the village. For people with that name, see Newdigate (surname). For other uses, see Newdigate (disambiguation). 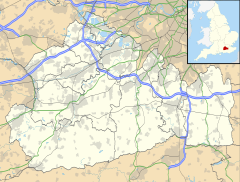 Newdigate is a village and civil parish in the Mole Valley borough of Surrey lying in a relatively flat part of the Weald to the east of the A24 road between Dorking and Horsham, 13 miles (21 km) ESE of Guildford and 25 miles (40 km) south of London. Neighbouring parishes are Charlwood, North Holmwood, South Holmwood, Leigh and Capel. The name of Newdigate refers to a place at the gate or path to a wood. Surviving manuscripts such as manorial rolls, Assize Rolls and Feet of Fines give forms including Newdegate (13th century), Newedegate and Neudegate (15th century) and Nudgate (16th century). The name Ewood (Iwode in Feet of Fines 1312) occurs in the parish and might derive from Old English for a forest of yew-trees, in which case the 'N' survives from a prefix such as 'in' (O.E. 'on') or 'at the' (O.E. 'be þane'). Alternatively, the word may refer to a 'New wood'. Newdigate was for the most part in Copthorne Hundred, forming a detached part of it. But the hamlet of Parkgate and the part of the parish near it were in Reigate Hundred. The place does not appear at all in the 1086 Domesday Book, and the connection with Copthorne is a probable result of the land holding by the Montfort family of Newdigate together with Ashtead Manor, while Parkgate was held with Reigate and Dorking by the Earls of Warenne and Surrey. Newdigate has a medieval church, St. Peter's Church, which is a grade II* listed building. Ewood (Yew Wood) was described during the medieval period as a "park" which was an enclosure of the forest for the purpose of deer hunting - the patent rolls of 1312 refer to it. As Newdigate began as a road through the forest (Reigate to Ockley) rather than a fixed settlement. An inclosure of considerable land later gave rise to the name Parkgate, the "gate" by now meaning an entrance. In 1564 Trinity College, Cambridge's estate at Newdigate was divided amongst various tenants who paid quit-rents, heriots, and owed suit of court. In 1702 its manor house and farms of Naylors, Horseland, and Bearland, in good repair, were let to Dr. Akehurst, remained in the possession of Trinity College until the middle of the 19th century. Newdigate Place also often early on named Newdigate Manor was the seat of Richard de Newdigate's family from 1234–5, a large house standing round a courtyard. Henry Nevill, then Lord Abergavenny at the close of the 16th century (Tudor Period) was overlord only of the manor, it having descended to him. Newdigate Place was almost totally demolished near the end of the 18th century. From 1636–1810 the manor was owned by the Budgen family. A former version standing close to it was pulled down by John Budgen owner between 1772 and 1805. In 1810 the buyer was the Duke of Norfolk. In 1298–9 Walter de la Poyle died seised of the site of the manor of Cudworth or Cudford, in Newdigate and Rusper, Sussex which he held of the Abbot of Chertsey in socage. Building material of medieval date visible in the footings of the present house suggest that in its final form the moated manor took the form of a courtyard house of which extensive remains may survive in what is now the garden of the house. In 1574 a survey was taken of the dwelling houses and buildings, including the ironworks, furnace, forge, and hammer, which were then worked by Robert Reynolds, who was occupying the mansion house and park, and who also held the brew house and watermill for grinding corn. The ironworks were then said to be worth £40 yearly. After many more owners — Sir Francis Carew was among the owners — Joseph Valentine Grimstead sold it to the Duke of Norfolk in 1786. In 1807 the Duke of Norfolk began to build a new house at Ewood, but it was never completed, and the part built was pulled down after the duke's death in 1815. By 1911 Henry Lee Steere of Jayes Park, Ockley, was Lord of the Manor. Fewer nobility have held this manor, namely in 1619 Kingsland Manor was briefly purchased by Sir Thomas Bludder and by 1716 ended up in the use of Ezra Gill, Lords of the manor of Temple Elfold, Capel. Owing to its iron foundry, for which a former lake, Ewood Pond was built, Newdigate was among the parishes excepted by name from the Act 1 Elizabeth against cutting of timber, and the works at Ewood were excepted by name from a later Act on the same matter owing to the good management of the woods. Based on the 1841 Census, Samuel Lewis (publisher) wrote in his topographical guide to England that the population was 552. St Peter's living as today is a rectory and in the patronage of the Crown. All tithes have been commuted for £580, and the glebe comprised in 1848 4 acres (1.6 ha). A description given in 1911 for the Victoria County Histories topological summary is in terms of land use: "The parish is still thickly wooded, and is purely agricultural, except for brick and tile works." Charities funded an exhibition (scholarship) for four years study for one of the school's pupils to Trinity College, Cambridge. From the 1930s to the early 1980s Newdigate was home to the Schermuly Rocket Pistol Apparatus Limited, manufacturer of devices for firing rescue lines to stricken ships. Newdigate is 1.6 miles (2.6 km) east of the A24 road between Dorking and Horsham, 13 miles (21 km) ESE of Guildford and 25 miles (40 km) south of London. Endemic to the soil in Newdigate are a number of thick clay beds making the area was home to numerous brickmaking businesses. However, the local brickworks is now a housing estate called Mulberry Place, or more commonly, "The Mulberries". Cudworth is a hamlet is 1 mile (1.6 km) southeast of the village centre of Newdigate. In its centre is a scheduled ancient monument, grade II* listed, tight-moated manor house, Cudworth Manor, see history above. Newdigate has a village shop with a sub post office and two public houses as well as many small businesses. Newdigate village hall is a substantial building hired out for activities and events. Due to a controlled number of properties in good condition, village amenities and Endowed Infant School the house prices in Newdigate are considerably higher than in nearby North and South Holmwood; the area is very much part of the London Commuter Belt and the nearest railway station is Holmwood railway station which is on the Mole Valley Line. The location of this station is in fact Beare Green, Capel 1.7 miles (2.7 km) away from the village centre. Newdigate civil parish had in 2001 a population of 1,524 in 625 households of which 17.7% were aged over 65; 3.9% of the population were in full-time further education; 76.8% of all men were economically active whereas 2.4% were unemployed, 5% worked part-time; 60.4% of all women were economically active whereas 0.9% were unemployed, 33.8% worked part-time. As to ethnicity, 98.8% of the population identified themselves as being white, 0.2% as black 0.2%, as of Indian descent, 0.2%, as of Pakistani descent and 0.0% as of mixed or other ethnicity. In terms of religion, 78.3%% of the population responded as being Christian, 0.4% as Muslim, 1.2% other religions, 13.8% as atheist and 6.6% declined to answer. Whereas 32.0% of the population worked in middle or higher professional occupations, based upon salary and title. Newdigate Infant School is in the village. ^ a b c d e f g h i j k l H.E. Malden, ed. (1911). "Parishes: Newdigate". A History of the County of Surrey: Volume 3. Institute of Historical Research. Retrieved 7 November 2012. ^ E. Ekwall, The Concise Oxford Dictionary of English Place-Names (Clarendon Press, Oxford 1947), p. 324, and pp. 185-86. ^ St. Peter's Church Grade II listing Historic England. "Details from listed building database (1378141)". National Heritage List for England. Retrieved 7 November 2012. ^ a b Grade II listing of Cudworth Manor Historic England. "Details from listed building database (1028715)". National Heritage List for England. Retrieved 7 November 2012. ^ a b Samuel Lewis, ed. (1848). "Newchurch - Newington". A Topographical Dictionary of England. Institute of Historical Research. Retrieved 7 November 2012. ^ "Schermuly website". Cyber-heritage.co.uk. 1 January 1929. Retrieved 16 March 2012. Wikimedia Commons has media related to Newdigate. This page was last edited on 15 March 2019, at 15:09 (UTC).